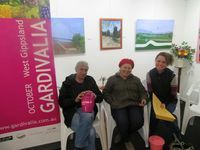 Gardivalia Festival of Gardens held its Gardeners Gathering yesterday at Red Tree Gallery in Jindivick. All our Open Garden participants received all the paraphernalia they need to open their garden - tickets, banner, helpful hints etc. 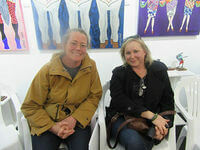 It was also an opportunity for gardeners to meet each other and discuss their garden experience. Our wonderful Karen Meyers supplied a delicious Devonshire tea. Thanks to Marian and Laurie Collins for their fabulous hospitality and the chance to stroll around their ever-changing sculpture garden and art gallery. Stan and Marjolijn from Kurinda Rose Garden kindly donated a beautiful rose to present to the Collins as a gift for the use of their gallery.